Tech inventions don’t develop from lucky accidents or random processes. Each new development proceeds in a logical order from earlier developments as improvements are designed and introduced. Technologies that you may be very comfortable with or take for granted today were once only possible in science fiction novels or movies, and even undreamt-of to the inventors of the past. Now, each year brings more and more new technical advances. 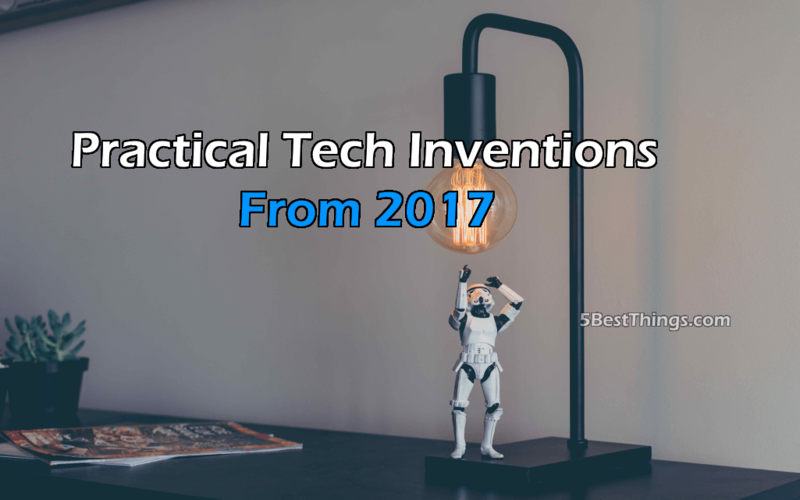 Here you’ll find a list of some of the most interesting new tech inventions that appeared in 2017. Research teams at Michigan State have produced a “ferroelectric nanogenerator”, or FENG. It is a paper-thin sheet of material that can generate energy from human motion, like the swipe of a finger. It is also pliable enough to roll up into a pocket. Developed under the guidance of associate professor Nelson Sepulveda, the device turns sound waves into energy pulses that you can hear on a computer or transforms energy signals into sound. Possible applications include automatically playing opposing sound waves to smother unwanted noise or as a voice-activated security patch for electronic devices. Toronto company eSight was founded in 2006 by computer engineer Conrad Lewis with the goal of assisting the visually impaired people. The end result is the eSight visor. It utilizes a high-def camera and built-in display for a digitally enhanced live video feed. Dual screens are adjusted to the corresponding eye. Everything looks bigger and brighter at up to 24x zoom. Lightweight and hands-free, it can help the legally blind to navigate their surroundings, read, and perform basic tasks. The eSight device operates by a rechargeable battery for full mobility of up to eight hours at a time. A tech startup named Physee has changed the way you might think about solar panels by building them into windows. Founded by CEO Ferdinand Grapperhaus, the technology uses solar cells installed around the edges of each window to capture sunlight and generate electricity. The windows come with USB outlets to recharge cell phones or power small devices. The next generation of Physee windows will be covered with a material that transforms UV light to infra-red and channels it to the solar cells, resulting in three times the efficiency. Numerous PowerWindows over large buildings will provide a clean, sustainable energy source in architectural designs of the future. The Core is a high-performance Wi-Fi router from Norton, the company known for Internet security. Smart devices that can go online and communicate with each other or your smartphone are changing the way our homes function. However, the age of connectivity means that hackers could compromise everything from coffee makers to home security systems. The Norton Core is designed to protect against these threats by monitoring for abnormal use. If one device indicates the presence of a virus, the Core can isolate it from other devices on your network. It will also automatically update its own software to keep your home network protected against new threats. The Ember Travel Mug is the first container that lets you control the temperature of your beverage. Your tea or coffee remains at the temperature you want so you get the greatest enjoyment at every sip. Engineer Clay Alexander founded Ember in 2012, and the Travel Mug is his second major release in the smart dishware category. Ember uses a microprocessor and an array of sensors to track and adjust for temperature changes. Reinforced with a ceramic coating for durability, the Ember mug allows you to set your ideal temperature between 120 and 145 degrees Fahrenheit through its app. This lasts for an hour on a charge or indefinitely if left on its charging saucer. In summary, technology often takes surprising new directions in the hands of innovators. The five products above are just some of the great ideas that are already changing our lives. Whether it’s computerized visual aids, smart routers, or smart mugs, 2017 has been an inspiring year.